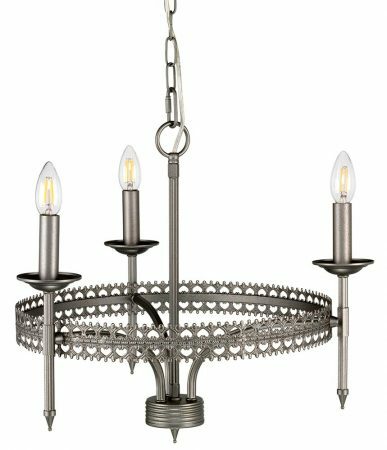 This Elstead Crown 3 light chandelier ceiling light in iron gate finish is traditional and rustic. 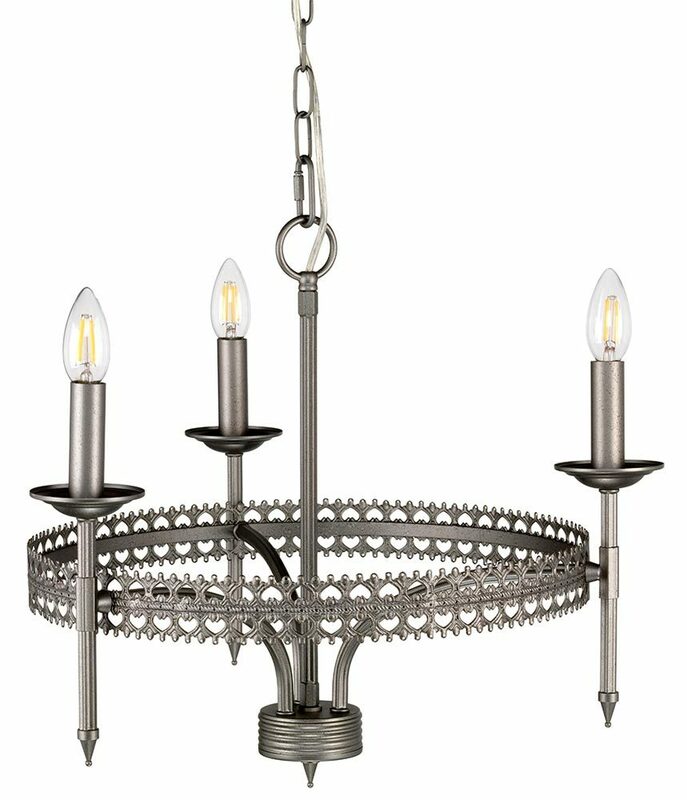 Featuring a ceiling mount, chain suspension and central rod, with filigree metalwork rim and curving arms attached to tall candle style lights. Each light is fitted with a metal candle pan, tall candle sleeve and spiked lower finial. Finished in a hand painted grey, this ironwork ceiling light is supplied with 152cm of height adjustable chain. Ideal for a traditional, Gothic or rustic dining room, hallway, bedroom or living room. There are matching fittings available in the Crown iron gate finish lighting range; please see below for the complete collection. This rustic design is supplied by Elstead Lighting, a British company that specialise in the manufacture and distribution of quality decorative lighting such as the Crown 3 light chandelier ceiling light in iron gate finish you see here. It’s not just ceiling lights that Elstead offer, go to our main Elstead lighting section for a comprehensive choice of lights for walls, as well as IP rated lighting for bathrooms.